The other day my son got ambushed – first by me with a few pillows. Then his dad poked and tickled him until he was begging for mercy. We all ended up collapsing on the couch, giggling and relaxed. My little guy is actually as tall as me now. He’s 13 and growing. But that hasn’t changed the fact that roughhousing is a regular part of our family life. It’s one of our favorite indoor activities. And as guest posters, Drs. 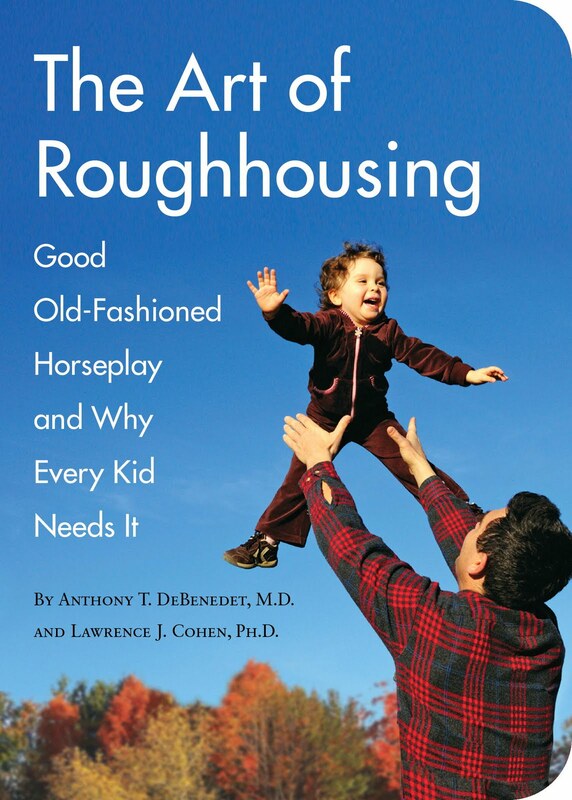 Anthony DeBenedet, MD and Lawrence Cohen, Ph D, authors of The Art Of Roughhousing, explains, roughhousing is more than just a fun family fitness activity. When you roughhouse with your children you can make a critical difference in your child’s mental, social and physical development. Take it away, Doctors Anthony and Lawrence . . . Thank you Sarah for inviting us to post on your blog! Since writing The Art of Roughhousing, we have been talking to parents and children all over the world about why roughhousing is important and how to do it in a healthy and mindful way. For this post, we thought we could focus on one of our favorite benefits of parent-child roughhousing: it makes kids brilliant! We think of intelligence in three ways: cognitive, emotional, and social. From a purely cognitive perspective, parent-child roughhousing releases brain-derived neurotrophic factor which is fertilizer for kids’ brains. That means it literally helps build neural connections — obviously a big part of brain development. The prefrontal cortex (which handles high-level judgments). This simultaneous activation is another key to brain development. Research shows that how well and how much children engage in rowdy, physical play predicts their academic achievement in elementary school better than any test score. From an emotional intelligence standpoint, the natural arc of revving up and winding down helps kids build internal “emotional dimmer switches,” which help them manage their feelings. This is why roughhousing is sometimes called the natural ADHD vaccine. Good roughhousing also involves lots of eye contact and nonverbal communication, which is how kids learn to read the emotions of others. Finally, roughhousing helps kids learn concepts of social intelligence, morality, and ethics by teaching them about role-reversal, which helps optimize team dynamics, and self-handicapping (learning to hold back their strength), which is a moral behavior that also promotes healthy group psychology. But most of all, roughhousing is tons of fun! So get out the pillows, wrestle and roll around, and practice your flips and leaps! Great advice! What’s been your experience with roughhousing? Have you noticed it helps your kids in different ways? Please share your stories below!